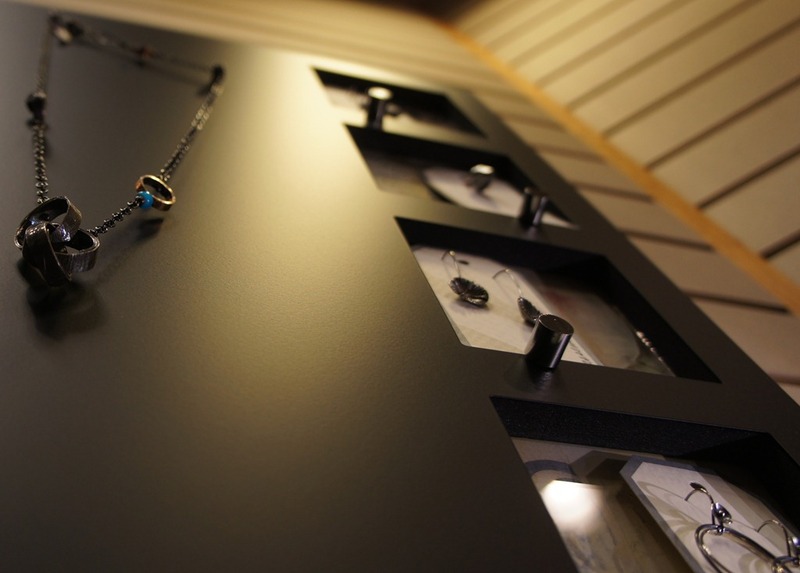 Leanne Stremcha (Assemblage Jewelry) alerted me last week to Saturday’s opening of the Fine Craft Collective shop downtown in the old Hoffman’s Photography location. Robbie and I paid a visit around noon and went back at 4 for the wine and cheese grand opening. Robbie bought stuff. I took photos. 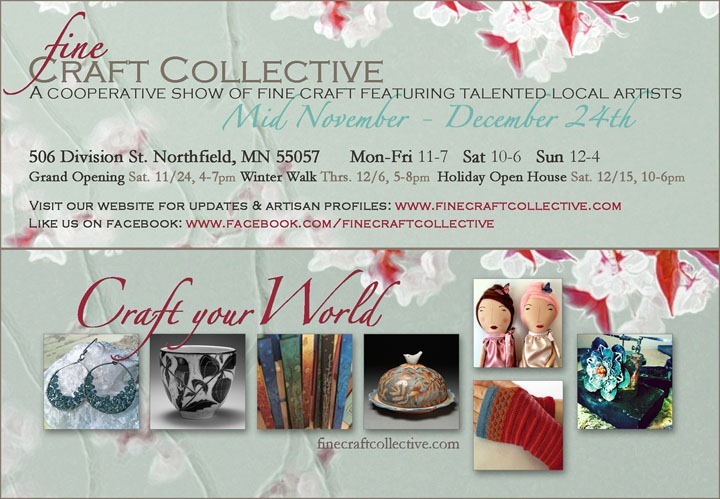 The Fine Craft Collective, Northfield’s artisan pop-up shop, has once again opened it’s doors for the holidays. Our grand opening is Saturday, November 24th! Stop in to enjoy refreshments and see all the beautiful pieces by our talented local artists. 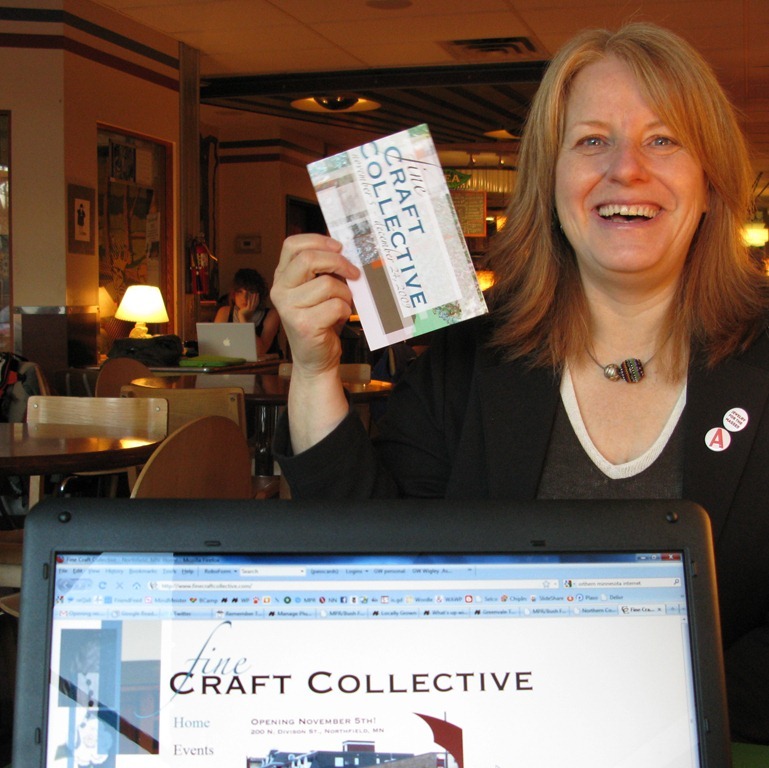 This year the Fine Craft collective will be open seven days a week at 605 Division Street. More than just the personal touch of an object made by hand, this co-operative gallery gives a personal connection between artisans and shoppers. A member of the show is there every day so that they can dialogue about the work – gain ideas and offer insight. Shoppers can see a variety of goods for special gifts and everyday life, and know that their purchase will directly support their community. The more research that is done about buying local, the more we can all see how local purchases, especially of goods that are also locally produced, help keep our towns and neighborhoods thriving. 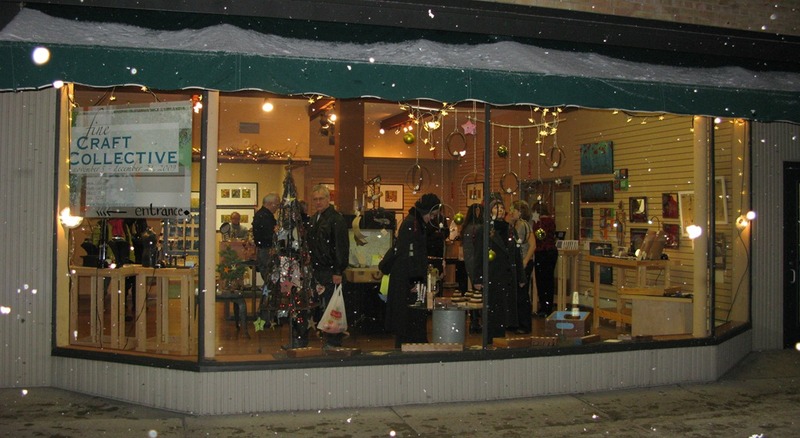 I wanted to invite you to attend the Artist’s Reception for the opening of the Fine Craft Collective for 2009. This year, we are in a new space, 200 Division St., right next door to KYMN radio. We have 18 artists in the show this year and they’ve all been making new work to delight and excite you. I’m thrilled with our new larger space. We have more room than ever to showcase all our locally crafted art. We hope we have something for every taste but if we don’t many of the artist’s are ready to work with you to make a unique custom piece just for you. Please come down this Thursday, November 5th, from 5 – 8 pm. to join in the celebration. Light refreshments will be served. To read more about the show and the artists in the show, check out our website, www.finecraftcollective.com.